Are you all following along with fashion week right now? It's all over my feeds and also just a fairly large presence in the city, so I'm following along by default. I've been into fashion since I was very young and have always followed the fashion months, so this year is no surprise. If I'm being honest, I don't get as excited about fashion week as I used to. A lot has changed and it really just isn't the same. The entire collection was beautiful, as always, but I was particularly fond of these two neutral looks. With a little shift in proportion, these are two outfits you could easily wear on the street. As much as I've been getting into bright color, my go-to will always be a classic, clean neutral look with traditional elements like cable knits and crisp white button-down shirts. Tory always puts on a beautiful show and this season was no different with the gorgeous floral surroundings. Weirdly enough, I felt like this Tory collection looked more like what I'd expect from Kate Spade than what the Kate Spade collection actually looked like. 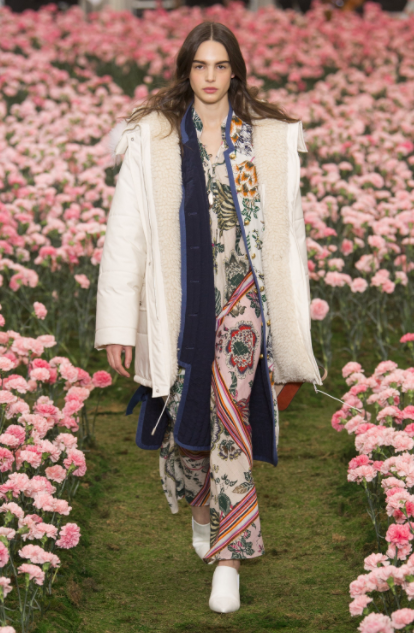 I, of course, loved the classic outerwear pieces but especially loved them layered over the feminine, boho-meets-preppy pieces Tory is known for. Also, the beauty looks in this show were so lovely. Mara Hoffman is a designer I've been getting more and more into recently, particularly after trying on one of her gorgeous gingham coats. The Fall 2018 collection was shot against a serene, desert backdrop which was the perfect companion to the colorful dresses and relaxed separates. This was such a gorgeous show. Brandon Maxwell is quickly ascending to the very top when it comes to producing phenomenal red carpet-type looks. One of my very favorite styling tricks is pairing high with low and he did it so well with this collection. I love the little white t-shirt tucked into a ball gown as well as the simple sweater and skinny trousers with that gorgeous satin bow. I met Desmond in passing late last year and you guys, he's the sweetest kid. He's also an incredibly cool, award-winning LGBTQ activist and drag. He walked in Gypsy Sport's show this year (which, by the way, was 100% the most diverse show I've ever seen) and absolutely killed it. I thought it was super adorable when I heard that he watched old Anna Sui shows from the 90s to practice!